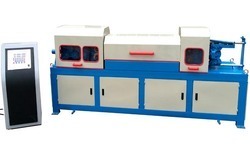 Our product range includes a wide range of decoiling machine. 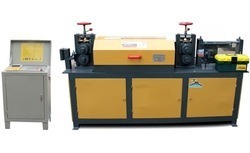 Our company is quality approved manufacturer, supplier and exporter of Rebar straightening Machines. The most demanding model has a long run history of serving the construction industry, residential, Commercial or infrastructure projects. This superior quality machine uses simple hydraulic technology to generate required results. The electrical panel provides fully automatic functions where the operator can choose the length to cut and the number of pieces to cut. The rollers do the straightening of the wire which are made of high quality raw material. 200kgs heavier than the normal model. Easy straightening upto 12mm. Easy installation.